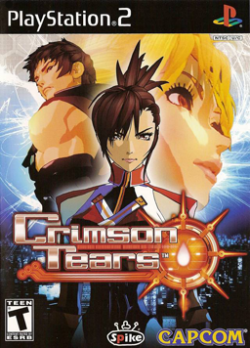 Game description: Set in Tokyo in the year 2049, Crimson Tears puts you in the role of one of three biological war weapons with a common mission--to investigate the cause of a mysterious disaster that has left the city incapacitated. Your various objectives take you into battle against hordes of enemies and into mazelike environments. Use your martial arts training and weapons to fight your way to the core of A.R.M.A. (the weapons manufacturer that created you), where the answers to the mysteries lie. The game revolves around three characters whose home has been destroyed. As seen on the game's front cover, this trio seems human; however, they are actually bio-engineered weapons developed by a company named A.R.M.A. called "mutanoids". 3D Character Models seem to have a ghosting/after image effect around the characters left side in some scenes. Significant ghosting on characters in some scenes. Setting TC Offset X to 500 reduces and centers the ghosts.